For the past few weeks, my kids have been doing nothing but getting ready for Japanese Quiz Bowl! Extra classes, extra homework, extra studying, extra e-mails from teachers, extra study sessions with classmates — and I do not have to say a thing. Japanese Quiz Bowl is serious business. 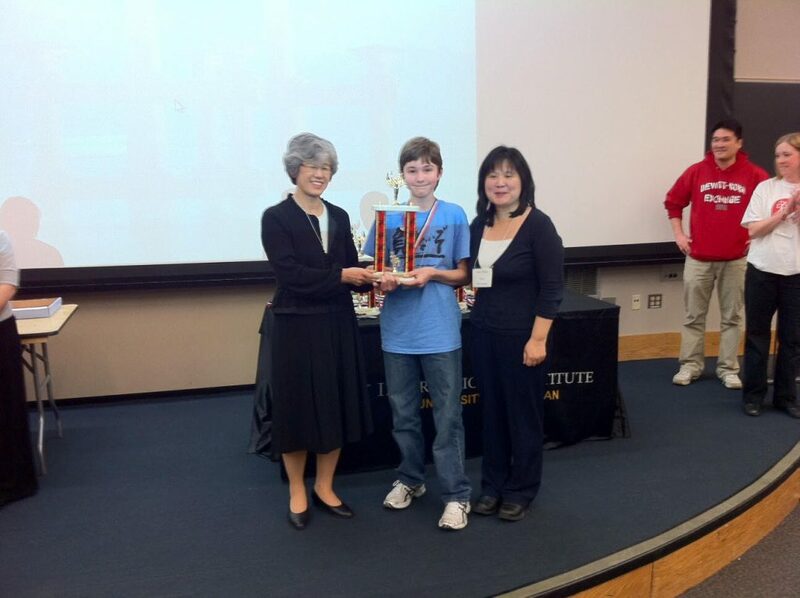 According to the University of MichiganCenter for Japanese Studies, this 17th annual competition, which took place Saturday, March 20 at the University of Michigan, had approximately 375 students from 26 elementary and secondary schools from across the state competing in six different divisions. Bet you did not know that 26 elementary and secondary schools in Michigan teach Japanese as a foreign language. College students and Japanese language instructors from Eastern Michigan University, Michigan State University, Oakland University, University of Michigan, Wayne State University, Western Michigan University and private language schools volunteered as judges, scorekeepers and timekeepers. That is a lot of university students learning Japanese, too. Every year, the students, parents and coaches completely fill the big lecture hall in the Modern Languages Building at 7 a.m. on a Saturday morning. It is hot in there! Those who speak Japanese at home or who have lived in Japan are not eligible to compete, so these are students of all races and ethnicities who are intrigued by Japanese culture and are learning Japanese as a foreign language. Dignitaries from the Japanese consulate give speeches to encourage the students with their language learning, punctuated by cultural performances of taiko or kendo, but they do not convince as effectively as Wizzywig’s siren display of anime and manga toys out in the hallway, their endless supply of Pocky and Hichew. The students work in teams to answer questions in a quiz-bowl-type format about spoken Japanese, written Japanese and Japanese culture. Electric buzzers sit on the table in front of each team. When the students are asked a question, the first team to hit the buzzer answers. If they answer incorrectly, the other team gets a chance. Sometimes in their nervousness or in their confidence, students hit the buzzer before the whole question is read, which results in some interesting answers. Sometimes students hit the buzzer before they have fully formulated their answer. Occasionally, buzzers malfunction. Afterward, a big group of us always struts across campus in the sunshine — flying high off the day’s competition — to the University of Michigan Japan Students Association’s Japan Cultural Festival in East Hall for food, performances and games. Little Brother loves fishing for the paper balloons. His sisters head straight for the food — okonomiyaki, tempura, gyoza, yakisoba. I go for the contrasts. Elegant gray-haired ladies in beautiful kimonos perform koto (Japanese harp) and the tea ceremonywhile the Japanese foreign students rock out with all-electric instruments, Japanese rap, hair-styling booths and massive food-eating competitions. The martial arts demonstrations are my favorite — karate, kendo — not least because I love the juxtaposition of the largely Japanese audience screaming like tourists and ducking to get out of the way while the multiracial and multi-ethnic group of American martial artists bow, stomp, and shout in Japanese, arms and legs and swords flying. Representing Ann Arbor this year was Emerson School and Ohara Language School (which had students from Pioneer High School, Saline High School and Clague Middle School). Japanese Quiz Bowl is directed and co-sponsored by the University of Michigan’s Center for Japanese Studies and the Japanese Teachers’ Association of Michigan (JTAM), with support from the Consulate General of Japan in Detroit and the Japan Business Society of Detroit. Frances Kai-Hwa Wang is a second-generation Chinese American from California who now divides her time between Ann Arbor and the Big Island of Hawaii. She is editor of IMDiversity.com Asian American Village, lead multicultural contributor for AnnArbor.com and a contributor for New America Media’s Ethnoblog. She is a popular speaker on Asian Pacific American and multicultural issues. Check out her Web site at franceskaihwawang.com, her blog at franceskaihwawang.blogspot.com and reach her at fkwang888@gmail.com.